If you feel as though your credit is in need of some work, you're in good company. The average American's credit score falls just below what most lenders consider a good credit score. Having good credit comes with a multitude of benefits: you will have an easier time qualifying for loans and credit cards, reduce the likelihood of paying utility and apartment deposits, and be more likely to get lower interest rates. At the very least, improving your score opens up opportunities that you didn't have before. In this guide, we look at the various methods in which you can improve your credit no matter where you currently stand. Before you begin fixing your credit, you need to know what factors affect your credit score. What Else Can Affect My Credit? Bankruptcies: Bankruptcies can severely damage your credit. Additionally, the amount of time it takes for these to drop off also depends on the type of bankruptcy that was filed: Chapter 13 bankruptcies stay on your credit report for seven years while Chapter 7 bankruptcies stay on your credit report for ten years. Charge-offs: These occur when debts are no longer collectible by creditors and are sold to a debt buyer who then tries to collect the debt amount (along with the additional charges like late fees and interest). These should still be paid as soon as possible even if they are no longer collectible by creditors. Collections: Collections affect your score than most other negative items since more recent debt makes up a higher percentage of your credit score. The debts that appear can include loans, gas bills, electric bills, medical bills, or unpaid tickets. Collections are sold multiple times to collectors so they are more likely to have errors. When paying off debts in collections, start off by eliminating the debt that affects your credit the most. Try to pay off this debt in full since partially repaying them will reset the starting debt and cause it to stay on your credit report longer. You can negotiate with a collection agency to pay a lower amount than what you owe, although you might have to report that lowered amount as income on your tax return (which can result in higher taxes if you wind up in a different income bracket). Be sure to keep documentation and records of any payments you make in writing to prove you have made payments. Changes in collections may take 1 to 2 months to be reflected in your credit report. Credit inquiries: Inquiries are recorded by the three major bureaus (Experian, Equifax, and TransUnion) and remain on your credit report for up to 2 years. Avoid applying for new credit too frequently since each hard inquiry (which occurs when applying for credit) can drop your score by a few points; however, soft inquiries (which occurs with prequalification inquiries and employment checks) do not hurt your score. Foreclosures: These items appear on your credit report for up to 7 years. Judgments: These items are reported for up to 7 years after the lawsuit or until the statute of limitations has expired (which may be shorter depending on the state's law). Late payments: These are payments over 30 days late, although some creditors will not report it until a second payment is owed. Your credit reports will show how late your accounts are (30, 60, 90 days, or more). Late payments and delinquent accounts are reported for 7 years after the final scheduled payment. Loan defaults: Loan defaults are reported until the loan is paid off in full. Past due payments: Past due payments are loan payments that have not been made at the time of its due date. Public records: These are court-related items such as bankruptcies, judgments, and tax liens. The information listed will show the name, amount, date filed, and whether the account is paid or unpaid. Repossessions: Repossessions are reported for up to 7 years after the initial listing. Consumers are responsible for paying off any remaining debt. Tax liens: Paid tax liens are reported from the payment date for up to 7 years while unpaid tax liens stay on your credit report indefinitely; however, credit bureaus can remove them after 10 years. According to a study conducted by the FTC, 5 percent of consumers had errors on their credit reports that could lead to less favorable terms on loans. The first step you should take to improve your credit is to make sure your credit reports are accurate. Errors in your credit report can lead to denial for loans or higher interest rates and fees on loans you qualify for. In more extreme cases, you could be denied for a job or apartment since some employers and landlords see good credit as a sign of reliability. Check your credit reports from Experian, Equifax, and TransUnion for inaccurate information. Under the Fair Credit Reporting Act, you are entitled to receive a free copy of your credit reports from all three bureaus once a year from AnnualCreditReport.com (the government-mandated site run by the major bureaus). You can also go to each bureau's website and order individual copies. Is your personal information (such as your name, address, birth date, and Social Security number) correct? Are all of your credit accounts reported? Are there credit accounts you don't recognize? Are there applications and inquiries you don't recognize? Is there outdated information still being reported? Are there late or missed payments that you believe you paid on time? Be sure to check all three of your credit reports since there may be inaccuracies listed on one that is not listed on others. The next step to improving your credit it to begin the process of credit repair. 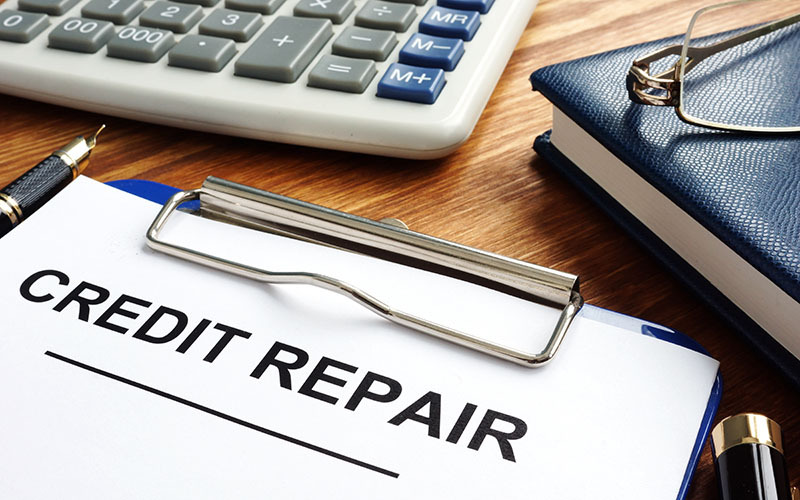 Credit repair allows you to take inaccurate and unverifiable information on your credit reports and dispute them with the bureaus to have them removed. You can either do this yourself or hire a credit repair company. We recommend using a reputable credit repair service since they know the ins and outs of the industry. Consider contacting a credit counselor or credit repair agency to seek further assistance on improving your credit. Out of all other variables, your payment history has the biggest impact on your credit score -- this accounts for 35% of your score. Always pay your credit cards, loans, and other bills (rent, utilities, and phone) on time. Lenders want to check how reliable you are at paying your bills since your history of payments indicate how reliable you will be in the future. Missing a payment or making a late payment can drastically drop your credit score. These marks appear on your credit report for seven years but their effect on your score decreases over time. To avoid making late payments, you can set your accounts to autopay or mark them in your calendar as a reminder. If you do happen to miss one, make sure you pay it as soon as possible; lenders usually don't report a late payment until it is 30 days past due. The process of improving your credit by paying off your debt is not quick, but it is important. As long as you begin making on-time payments now, it will help you show your recent credit history as positive. On a similar note, if you have any delinquent accounts, you can contact your creditors and ask if they will revoke the past due payments once you make arrangements to pay them off. Even if your creditors won't remove delinquent accounts, you can still show good standing by paying them off -- the longer an account is delinquent, the more it hurts your score. Be sure to pay off any overdue accounts before focusing on any of your debts that are close to their limits or loans that are close to the initial amount borrowed. Accounts that are six months past due can be charged-off by creditors and remain on your credit report for seven years. In this case you have two options: you can either pay the overdue balance in full or contact your creditor and ask for a way in which you can avoid a charge-off. Although it might be difficult, they may work with you to reduce or remove the total sum and penalties. However, keep in mind that paying off accounts like collections will not remove it from your credit report -- these will stay on your report for seven years. When you are paying off collections, be sure to pay them off in full since partial payments end up resetting the payment date and damaging your credit further. Pay off the most recent delinquent accounts and focus on non-medical collection debt (these have a greater impact on your score) before tackling medical collections. If your budget is tight, you may have to find ways to save every dollar you can to pay off your debt. Getting out of debt may feel like a difficult process, but it can be done with hard work and time. Your credit utilization -- how much revolving credit you have versus how much you use -- plays a large role in your credit score. The less available credit you use, the better it is for your overall credit health. Ideally, you want to keep your credit usage under 30%. If you are currently utilizing more than that, you can pay down your balances. Since your credit score takes into account how many of your credit cards are being utilized, you may want to consolidate multiple credit cards into one through a balance transfer card (which usually has an APR of 0% for a short period of time) or use a personal loan (which could potentially have lower interest rates) to pay off your credit card debt. After this, you can choose to use a specific card for your purchases. Pay off your cards with the highest balances first. Use your credit card as though it were a debit card by paying it off as soon as you use it for a purchase. Since credit card issuers usually report to the bureaus monthly, your score will be updated as soon as your lower utilization is reported. Avoid closing any of your old accounts, even if they are credit accounts that you have completely paid off. The length of your credit history plays an important role in your overall credit. The longer your credit history, the better. In general, having a credit history with an average length of five years will affect your credit positively. If you have no credit history, it will take around three to six months for new credit to show up on your credit report. With a short credit history, your best option is to continue making sound financial choices. You may also want to consider having a trusted family member or friend add you as an authorized user to their credit card (if they have good credit and history of on-time payments), which means they would be responsible for any charges you make. However, this method can be risky since you are putting a personal relationship on the line. Work on establishing new credit by opening a new credit line such as a credit card or personal loan. You may also take out a credit-builder loan, such as those from Self Lender. These credit builder accounts are small installment loans saved in a CD that can assist you in building your credit. In the case that you are denied for a credit line, you may want to consider a secured credit card. Secured cards require you to make a deposit into an account to secure the line of credit issued to you by a bank, credit union, or other lender and the deposit is used to pay your balance in the case that you default on any of your payments. A secured credit card is easier to qualify for with bad credit and shows creditors that you are responsible with payments. Once you can prove that you make on-time payments, you can try for a regular credit card again in six months to a year. You may also take out a store credit card as an entry-level means to build credit. A word of caution: opening a new credit line may not be a good option if you are already struggling with debt. You need to be in good standing with your creditors before taking out more credit. Additionally, be sure to not to make too many inquiries in a short period of time while applying for new credit since this can damage your credit. The more credit lines you apply for, the more your credit will be negatively affected. Although the impact of a hard inquiry seems small (usually around 5 points), it can make a difference when applying for a loan or trying to receive the lowest possible interest rates. Soft inquiries (or soft pulls) do not affect your credit and can occur without your permission. These are usually done as a prequalification for loans or as part of a background check. Check your credit reports for any unauthorized hard inquiries. If you suspect fraud, you can contact the credit bureaus to dispute and remove them from your credit reports. Monitor your credit through a trusted credit monitoring service. These can not only check for changes in your credit, but they can also provide you with additional financial assistance and identity theft protection and recovery services. If you're struggling with bad credit, don't lose hope. With the help of credit repair and some smart financial choices, you can build and maintain positive credit for the future.